The Blog hasn't seen much action over the past few weeks (sadly the same goes for the kitchen, too) but for good reason. Many of you will already know that I've been busy working on Cambridge's first local food and drink festival, Eat Cambridge, which takes place between 1 and 17 March 2013. It is fair to say that the event has so far been a huge success for our local, independent food and drink producers, suppliers and local cooks and chefs, and has attracted a great amount of interest and support from the good people of Cambridge. I've loved every minute of helping to plan the festival; from working with such passionate foodie individuals, to bringing together the city's food lovers in delicious, entertaining, weird and wonderful food and drink situations. I know I'm biased but I couldn't resist a series of blog posts sharing my highlights of the festival. 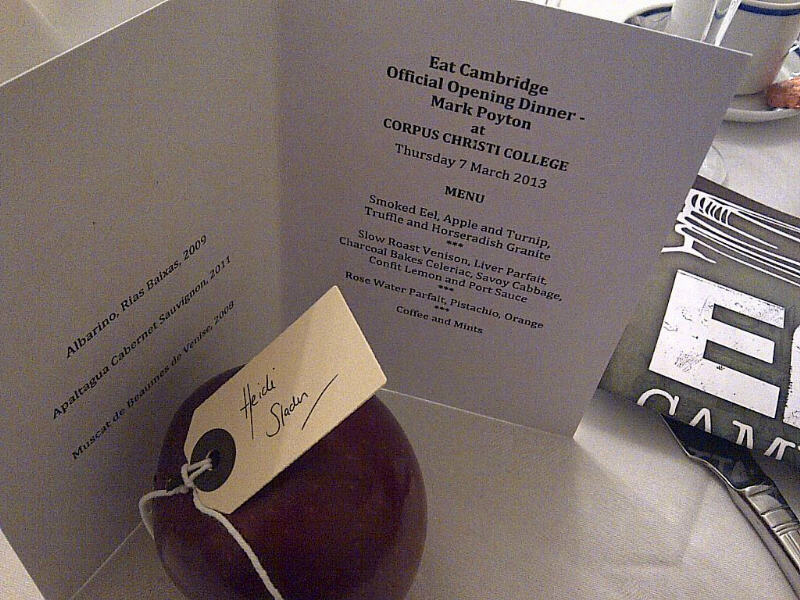 I hope you enjoy the first of many: my account of the official opening dinner. Originally scheduled to run for a week, from 8 - 15 March, the festival received such an overwhelming response that a two-week window of fringe events and special Eat Cambridge offerings was suddenly and easily filled.  Despite a few sad diary clashes (and day job commitments) I've managed to sign up for a glorious array of events, all of which will sum up and celebrate the local food scene perfectly. First up for me was the official opening dinner on Thursday 7 March, held at Corpus Christi college in the centre of town and based on a concept to bring food and history, town and gown together, lovingly dreamt up by festival organiser Caroline Biggs and put into action by fellow organiser Sian Townsend, Chris Le-Vien of Corpus, food historian Dr Annie Gray, and resident chef for the evening Mark Poynton of Alimentum. Those of you who know my background of town, then gown, then town again, will know that my four years spent dining in Cambridge colleges brought with them some rather special memories of formal halls, grand and exclusive suppers, and all the formalities and oddities that go alongside. 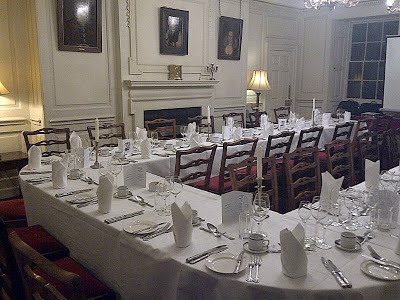 It was nice to be an insider again, if only for the evening, and to wind my way around the ancient courts and staircases of Corpus before settling down for dinner, glass of Champagne in hand, at tables covered by crisp white cloths and overseen by rows of historic figures in gilded frames. The company was excellent (the dinner attracted a diverse range of local foodies, Alimentum fans and supper club hosts) and the speaker, Dr Annie Gray, was a real hit: informing and entertaining us with a fascinating, and shocking, culinary history lesson, and effortlessly fielding heckling whilst throwing in casual mentions of whole bird pie garnishes and the skinning of cows' heads. Michelin-starred chef Mark was hard at work behind the scenes preparing a three-course menu inspired by the 16th century recipes of former Corpus Master's wife Margaret Parker. And when I say hard at work, I mean battling with the challenges of a much-reduced team, a prep area the size of a large shoe box with no running water, and a long old trek across the nearest court to a kitchen. The food was incredible: a perfect interpretation of the Parker cookbook's traditional British themes with Mark's contemporary treatment of fantastic quality ingredients evident in every bite. We feasted on a cold starter of smoked eel, apple and turnip with truffle and horseradish granite which was the highlight for me. It was a pretty dish despite the poor eel's reputation for ugliness. 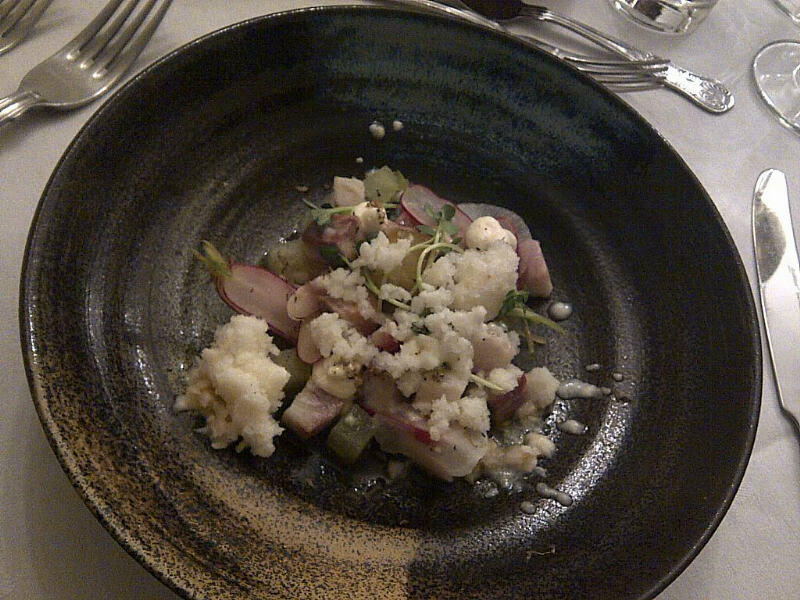 Delicate cubes of soft eel mingled with crisp thin slices of radish, and sharp and smoky flavours were balanced by the fluffy creaminess of the granite. We indulged in a main course of slow roast venison, thickly sliced from the softest hunk of deep red meat and served with charcoal baked celeriac and savoy cabbage, liver parfait, and a confit lemon and port sauce. 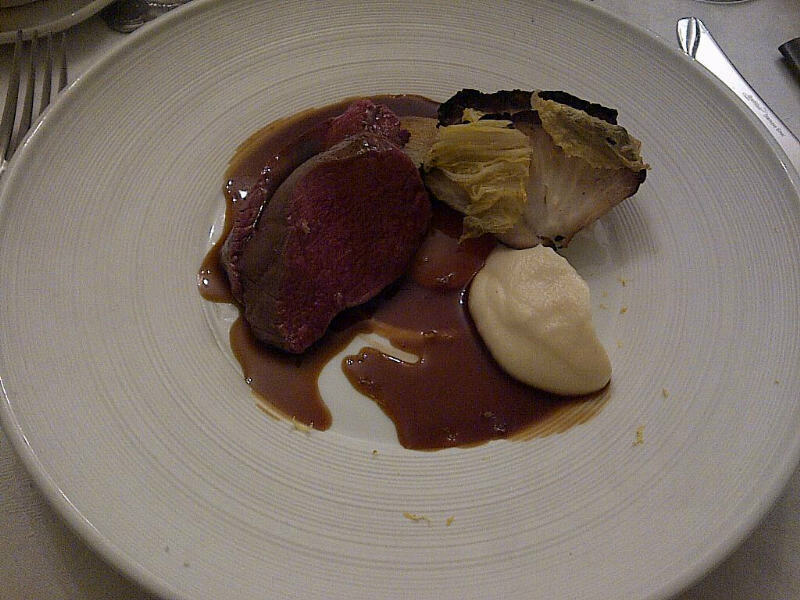 It was reassuringly recognisable: the ultimate comfort food of British veg, tender meat, and a rich and decadent sauce; but with a complexity that made the taste buds sit up and take notice of the depth of earthy flavours in the charred vegetables and the sweet and refreshing notes from the age-old winning combination of lemon and port. 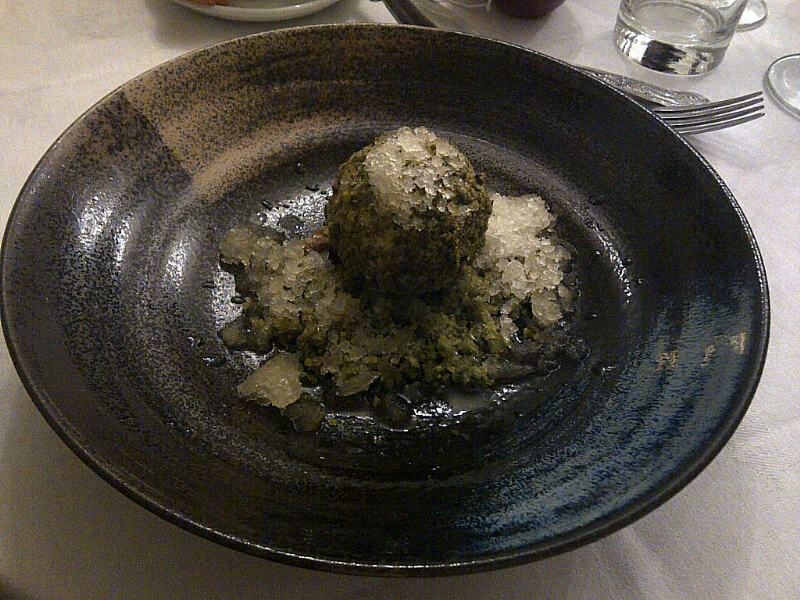 We were intrigued by a rose water parfait dessert, a perfect sphere of soapy-sweet iced cream entirely encased in crushed pistachio and garnished by the delicate flavours of an orange granita. 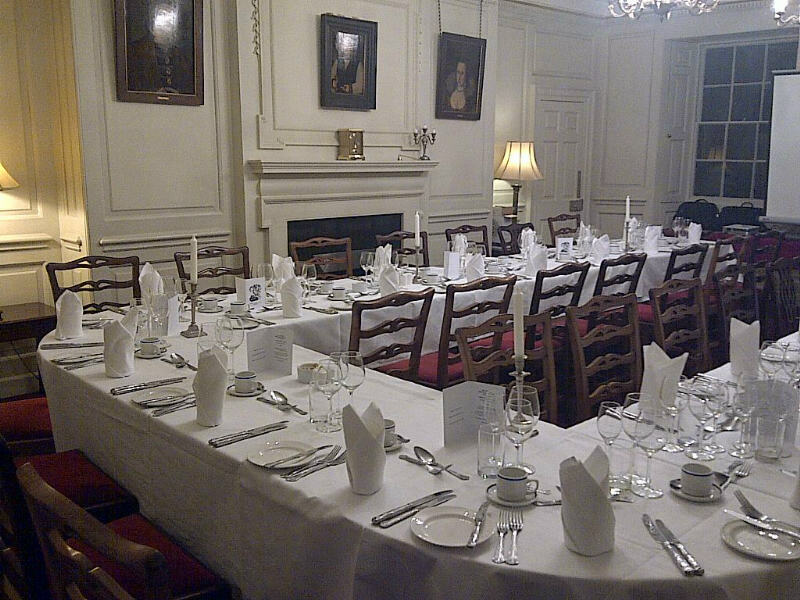 Wine matches were provided by Corpus, prompting another fond memory of the incredible cellars on offer to those dining in the colleges of Cambridge. Dessert wine, coffee, and farewells all arrived too quickly, signalling the end of a magical evening soon to become another warm, fuzzy memory of a fairytale setting and exquisite food. Find out more about Eat Cambridge at eat-cambridge.co.uk.